Donette Jackson tells her story of her second-generation farm in photos -- large photos of water leaving the banks of the Missouri River. The photos, taken from the air with the help of a friend, show a river overtaking farm ground. Since 2008, Jackson said her farm near Tekamah, Neb., has been inundated with flooding more often than not. 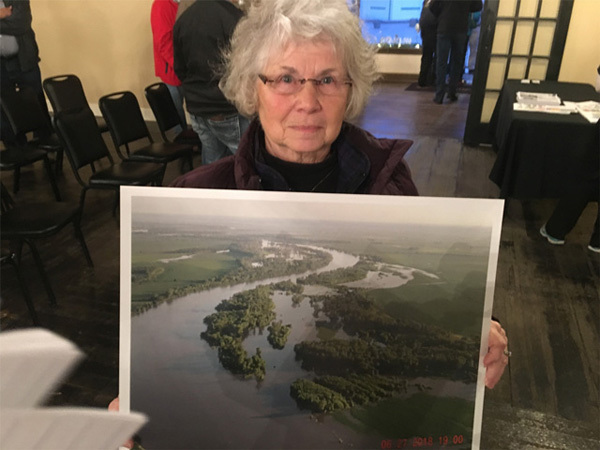 Jackson was one of an estimated crowd of more than 100 people, including mostly farmers, on hand Thursday evening, venting their frustrations to officials from the U.S. Army Corps of Engineers. Corps officials laid out a story that includes a timeline for recovery -- a long timeline that will depend on the willingness of Congress to appropriate funds to make permanent repairs to 40 levees breached in a basin overwhelmed by flood waters. Colonel John Hudson, commander of the Omaha district of the Corps, said even in a best-case scenario permanent repairs will take years -- but it can't be done without money. "We have an enormous amount of work to get done," he said. "We're working to put temporary measures in place and move into permanent repairs." The Corps is prioritizing temporary repairs along the Missouri River. Hudson said first on the list is a levee north of Percival, Iowa, followed by a levee straight east of Nebraska City near Hamburg, Iowa. Third is a large levee breech at the confluence of the Platte and Missouri rivers in Iowa. Hudson said flood waters gouged a scour hole 400 yards wide by 60 feet deep. Fourth will be repairs to a levee north of Bartlett, Iowa, near Interstate 29. "We prioritize levees based on risk," Hudson said. "There are 280 miles of levees compromised, many with significant erosion." The Corps laid out actions taken leading up to and following the flooding disaster that caused more than $3 billion of damage to agriculture in Nebraska, Iowa and Missouri -- showing how it followed the Corps' master manual for the basin. Corps officials explain how frozen ground, heavy rains, uncontrolled flood waters from the Platte River basin and the Niobrara River that couldn't have been accounted for in its management of the Missouri River basin last month. Uncontrolled flood waters from the Platte and the Niobrara overwhelmed the four large dams in the basin. "If we would have emptied all the reservoirs it would have done nothing," said John Remus, chief of Missouri River basin water management for the Corps. Water releases from Gavins Point Dam in South Dakota have been a subject of controversy. The dam contains less than 1% of all of the flood storage capacity in the basin. In March, the Corps took the extraordinary step of opening all 14 floodgates at Gavins Point. "We've never raised all 14 gates at Gavins Point," Remus said. "The gates were overtopping at Gavins Point. During the extreme circumstances we decided it was something we had to do." Many of the area residents on hand wanted the Corps to know it had been weeks since many of them were forced from their homes by flood waters, and their farms destroyed. Some wanted to know how the Corps plans to make it better. Some suggested the Corps undertake flood control on the Platte River -- something that could have helped hold back waters. Others suggested doing the same on the Niobrara. The Corps does not conduct flood control on the Niobrara. Remus said average flow on the Niobrara is usually around 4,000 cubic feet per second in the middle of March. Peak flows hit an astounding 182,000 cfs last month -- taking out the Spencer Dam. Since taking over the 240-acre family farm in 2008, Jackson said dealing with flood waters on about 30 acres along the river bottom has become a way of life -- in six of the past 11 years, in fact. "Flood control certainly is not on your to-do list," she told Corps officials. "When you hold back water releases in the winter you set up for spring flooding. The blame can't be put on Mother Nature. We are retired and farming is our livelihood. "We all know we have a changed river that is no longer the carry it once had. Now it flows much differently than before." Tekamah farmer Scott Olson, who saw much of his farm underwater in 2011, said about 500 acres are inundated again. Olson is a party to a lawsuit filed against the federal government for its handling of the Missouri River basin. The case has moved to the damages phase in recent weeks. "I doubt I get to farm it this year," he said. "If I get the 500 acres farmed this year I'll be surprised." Since the 2011 flood, Olson said he has been working with experts at the University of Nebraska-Lincoln on ways to help improve the 500-acre tract. "We had to put the farm back together," he said. "Sand deposits are still there from 2011." In giving testimony at the meeting, Olson told the Corps he was frustrated with a seeming lack of priority placed on flood control in the basin. "We need to get a good grip on the wildlife," he said. "We're trying to save fish and birds. Just think of the commerce that is lost -- the dollars affected all up and down the basin. Corn gone, feed gone, seed gone. The cost of this flooding we're having -- how do you wrap your head around it?" On Friday, Vice President Mike Pence and Iowa Gov. Kim Reynolds will visit a flooded farm near Pacific Junction, Iowa. Next Wednesday, Iowa Sen. Joni Ernst will lead a field hearing by the Senate Environment and Public Works Committee about management of the Missouri River with Corps officials and farmers in Glenwood, Iowa.